Authentic examination papers from Cambridge Assessment English provide perfect practice because they are EXACTLY like the real exam. 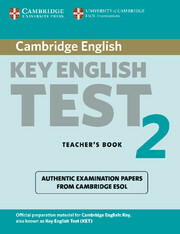 Inside A2 Key 1 for revised exam from 2020 you'll find four complete examination papers from Cambridge Assessment English. Be confident on exam day by working through each part of the exam so you can familiarise yourself with the format and practise your exam technique. The Audio CDs contain the recorded material for the Listening paper.A Student's Book with answers and audio and a Student's Book without answers (without audio) are available separately.